Today is just one of those average days. I got up, I went to work, came home and got back into the kitchen the first opportunity I had. I fancied a change and figured that I had been going pretty heavy on the calories of late, so fancied something a little lighter. In this case I went for a pair of wonderfully blushing, pink salmon fillets. I adore fish, when utilized properly it soars above most animal products in my opinion and really does have something special to offer. Sea bass, Tuna, haddock, Pollock, breem, they all have their own qualities to bring to a dish and sometimes just by adding a little something it can drive it up to the next level. 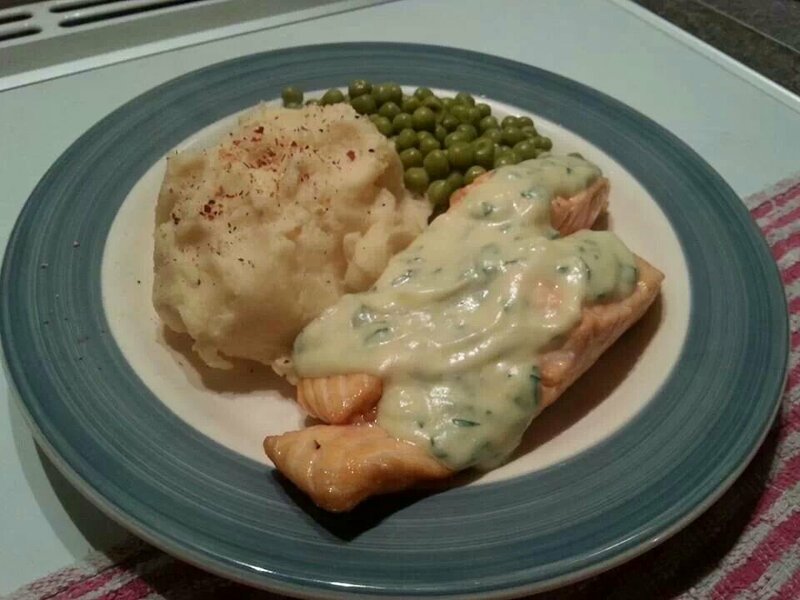 Which brings me to the point of this post, my parsley sauce. Its seriously simple but very good! Pinch of fine sea salt. 1. Add the olive oil, butter and flour to a pan on a low heat and mix together as the butter melts. Stir until combined into a paste like consistency. 2. Pour in the milk a little at a time, stirring constantly. 3. Add the mustard, salt and parsley. 4. Keep the sauce on a low heat for around 5 minutes, giving it a stir to make sure it doesn’t burn around the sides. And that’s it! Just spread over your favorite fish and enjoy. Its tasty and its simple. Not a combination people usually turn their nose up at…oh and the mustard really does make a difference to this one as well so don’t forget it! This entry was posted in chef, cooking, dining, food, home and tagged and, bake, blog, book, but, butter, chef, cook, cream, creamy, cut, dine, dining, easy, eat, england, fish, flour, grocery, herb, herbs, Home, if, internet, like, love, Michelin, milk, mustard, need, needed, no, pepper, potato, salmon, salt, sauce, shop, simple, star, tag, taste, uk, watch, where, why. Bookmark the permalink.